Josean Jimenez discovered that he loved food and cooking when he was a child. “Pretty early on when my parents would throw parties, I realized I’d rather be in the kitchen than anywhere else. 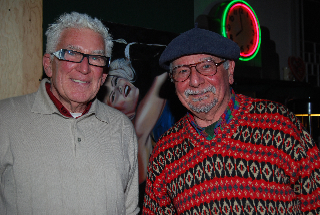 The kitchen is usually where everybody gathers,” he told me in a recent interview. Born in Puerto Rico, Jiminez grew up in Northampton, Massachusetts. Cooking classes he took in junior high school “sparked” his culinary abilities. He went on to study culinary arts at Smith Vocational High School and the Connecticut Culinary Institute. He worked his way up from dishwashing and prepping ingredients to chef at a number of Pioneer Valley Restaurants. The young chef ventured east to Martha’s Vineyard and Boston, but found that our valley in Western Massachusetts called him back. 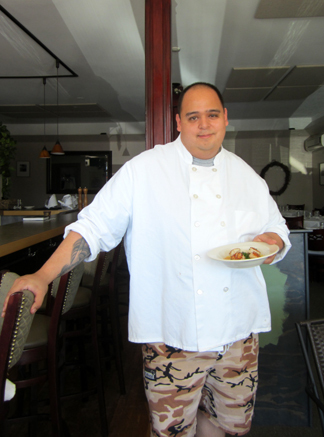 During his early years working for others Jimenez expanded his early interest in “multi-Spanish/Puerto-Rican/Creole food” to embrace a wide variety of cuisines. He also learned to manage restaurants as well as cook in them. Last year he decided he was ready to set out on his own and began looking for a restaurant in the Pioneer Valley. The location in South Deerfield, which had been a restaurant for many years and needed few alterations, suited him perfectly. It was manageable in size and attractive. More importantly, it represented only a 15-minute drive from the home in Chicopee he shares with his wife and their lively three-year-old twin sons, whom Jimenez obviously adores—although he also obviously finds them a handful. MRKT Restaurant opened in November. The winter months were long in the new restaurant, but business is brisk now that spring has arrived. Jimenez hopes to expand his hours (currently Tuesday through Sunday from 5 to 10 p.m.) to include lunch very soon. He is also planning international nights with guest chefs. Jimenez noted that the farm-to-table emphasis also suits his culinary temperament since he likes to alter his menu frequently. Responding to the growing season makes changes inevitable. “We’ve had the current menu for maybe four weeks and I’m ready to change it,” he said with a smile. However much the menu may vary, it will probably always feature small plates, which Jimenez likes to offer so that diners can share and taste as many food combinations as possible. The small plates on the menu when I visited included Hadley asparagus with goat-cheese fondue and a fried egg (the chef is very fond of eggs); chicken liver mousse with homemade jam, pickled mustard seed, and grilled toast; and the dish Jimenez served Paul Franz and me, sea scallops with a vegetable ragout and a carrot-cardamom reduction. 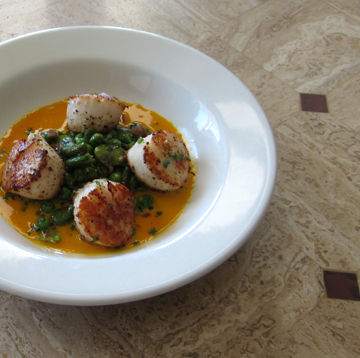 The orange of the carrot reduction and the green of the peas and beans shouted “spring,” and the dish provided contrasting consistencies to the palate: creamy sauce, tenderly chewy scallops, crunchy chives. We forked the scallops and vegetables down quickly and then asked Josean Jimenez for a spoon so we could savor every drop of the carrot reduction. First, prepare the reduction. In a saucepan combine the carrot juice and cardamom pod. Bring the mixture to a boil and simmer until it reduces by half (about 5 to 10 minutes). Stir in the cream, and again reduce by about half, or until slightly thick (about 5 minutes more). Remove the reduction from the heat, add salt and pepper, and set aside. Move on to the scallops. Sprinkle salt and pepper over the scallops. In a small sauté pan heat a splash of canola oil. Sear the scallops over medium high heat until they are golden brown on both sides (around 2 to 5 minutes, depending on your stove). Add the teaspoon of butter just as they are about to finish cooking. In another small sauté pan heat another splash of canola oil for the ragout. Sauté the red onion pieces briefly; then add the beans and peas. Sauté over medium heat for 1 minute. Add the vegetable stock, and cook for another minute. Toss in the butter when the stock is almost finished cooking. Season the ragout with the salt and pepper, and add the tablespoon of chives. 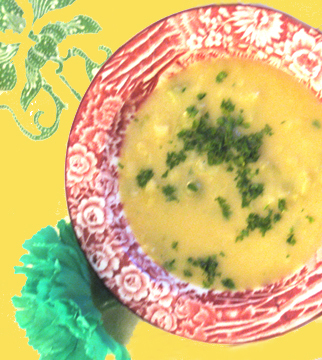 To serve the dish, ladle 1 ounce of the carrot sauce into a flat bowl. (You will have enough leftover sauce for several future servings.) Pour the vegetable ragout on top of the sauce, and place the scallops on top. Sprinkle chives on top and serve. 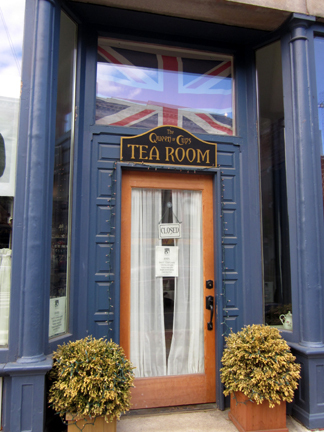 My friend Peter has been telling me for months that I would love the Queen of Cups Tea Room in Greenfield, Massachusetts. It takes me a while to get ANYWHERE, however, so I only recently managed to darken the Queen’s doorway. 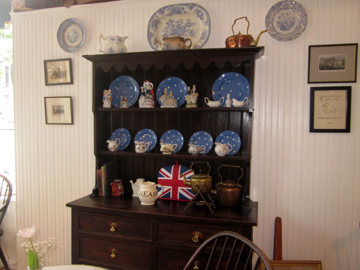 Decorative plates, cups, and teapots line the walls and the shelves. A leather chair sits in one corner waiting for a solitary tea drinker. Linen-covered tables welcome small groups of sippers. In the back of the shop a counter displays baked goods, particularly Becca’s beloved scones and cookies. Becca has lived in the United States for almost 20 years. A musician from Worcestershire, England, she married an American and lived for many years in urban areas in this country. Almost ten years ago she and her husband visited the home of his relatives in Deerfield, Massachusetts. They fell in love with New England, which resembles Becca’s native county. “It has the same kind of farms and the same kind of hillsides,” she told me with a smile on her face. She and her husband had already started a family—they now have a ten year old and a seven year old—and decided they wanted to raise that family in the area. As the children grew older and her musician husband continued to travel, Becca longed to find an occupation that would keep her near home and would make her available to her offspring in the evenings. I love the decor at the Queen of Cups! 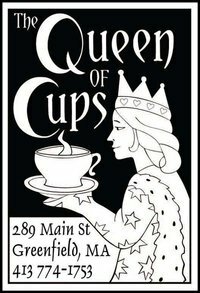 The Queen of Cups sprang from that desire—and from an observation Becca had made when friends and family visited from England. “I realized that there wasn’t anywhere within at least 40 miles where I could take them for a nice cup of tea,” she explained. An avid baker like her mother and grandmother before her, she welcomed the opportunity to tie on her apron and bake goodies to accompany those nice cups of tea. I am not a tea drinker, alas, but I do love sweets. 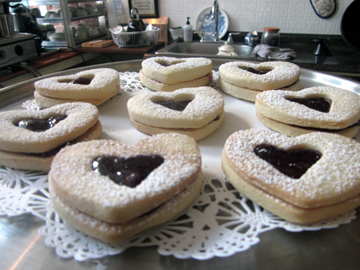 I convinced Becca to give me her recipe for Jammie Dodgers, the English equivalent of Linzer Tarts. Along with the formula for the cookies Becca shared her philosophy about recipes: “Very often, bakers guard their recipes as if their very livelihood depended on it. Personally, I have found that many of the greatest recipes are free. 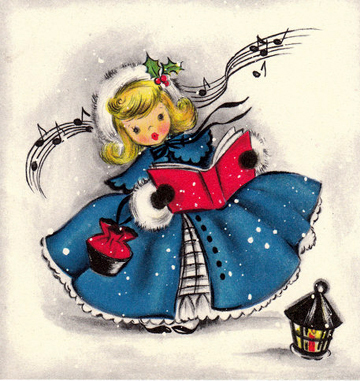 This one came originally from the back of a Tate & Lyon sugar packet in England, found by my mother in 1972. Becca pours tea to accompany a Jammie Dodger. I have to be frank and tell you that when I made these cookies they were much less lovely than Becca’s creations. And the jam (I didn’t have raspberry so I used strawberry) got a bit runny. They tasted absolutely wonderful, however. The cornstarch in the recipe gives them a unique, delicate texture. In a large bowl mix all ingredients (except the jam and final sugar!) until they come together in a soft ball. Wrap the ball in waxed paper and refrigerate for 1 hour. Remove the dough from its wrapping and place it on a lightly floured board. Whack it briefly with your rolling pin to start to loosen it up. Roll the dough out until it is 1/8 to 1/4 inch thick. Be sure to turn the dough 45 degrees with each roll to keep it even. If your rolling pin starts getting sticky, it’s perfectly all right to use your hands to roll the dough instead. Use your favorite cookie cutter to cut out shapes. 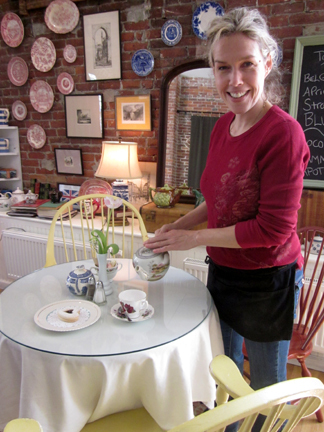 (A the tea shop they use a heart-shaped cutter). Cut out a smaller shape in the center of half of the cookies. 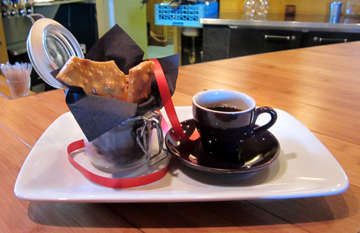 Place the unbaked cookies on parchment-covered sheets. (I used my silicone baking mat.) They do not expand in the oven so they may be reasonably close together. Let the cookies sit on their pans above a cooling rack for 20 to 25 minutes before removing. Just before serving cover the cookies that don’t have shapes cut out of them with a dab of jam; then cover the jam with the cut-out cookies so that the jam peeks through. Makes about a dozen cookies (more or less, depending on the size of one’s cookie cutters). March is Massachusetts Maple Month according to the Massachusetts Maple Producers Association. This organization of professional and amateur maple farmers is headed by Tom McCrumm of Ashfield. I figured I couldn’t visit a more appropriate farm than his to kick off my maple recipes this month so I headed recently to South Face Farm. 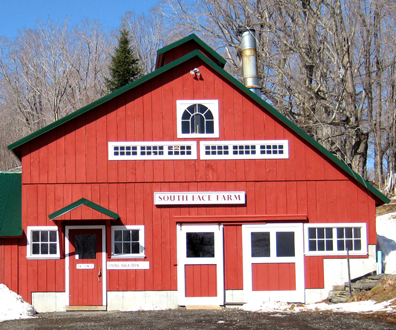 The sugarhouse at South Face Farm looks exactly as a sugarshack should. It sits on a quiet road, not far from Route 116 in Ashfield. Its low ceiling provides eaters with a sense of intimacy, and its décor is old fashioned. 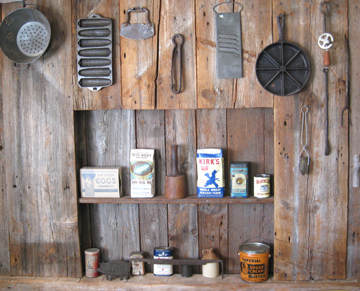 Old food tins and antique cooking implements line the walls. Large windows (many of them sporting a jug of amber syrup) look out on the farm Tom and his wife Judy Haupt steward. Tom invited me into the kitchen to watch Skylar Abbatiello of Ashfield make one of the sugarhouse’s signature foods, corn fritters. Skylar is a lanky, genial high-school student who is in his fourth year at the sugarhouse but his first year of cooking. He sounded proud of having worked his way up through the ranks at South Face Farm. Tom told me that this pattern is common among the restaurant’s staff members, who are both local and loyal. The kitchen definitely had a family atmosphere. Skylar was confidently and carefully supervised by the sugarhouse’s head cook (and kitchen designer), Bonnie, an Ashfield resident who preferred not to supply her last name. 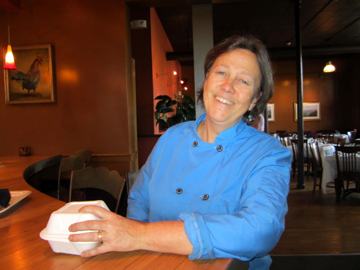 Bonnie explained that she and Tom McCrumm had developed the sugarhouse recipes to emphasize scratch cooking and local ingredients. The blueberries, eggs, milk, and ice cream served at the restaurant are all local—not to mention the maple syrup! Whisk together the flour, baking powder, salt, and pepper. In a separate bowl, beat together the milk and egg. Stir in the corn; then stir in the dry ingredients. The batter will be stiff. Preheat the oil in a deep-fat fryer (or preheat a frying pan with at least a couple of inches of oil) to 350 degrees. Using a small scoop or a spoon, gently place quarter-cup blobs of batter in the oil. Do not overfill your pan; if it is too full the oil will cool off. 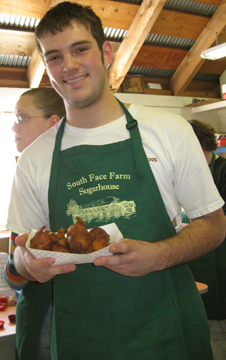 Do not make larger fritters, or they will not cook through and will be doughy in the center. Cook the fritters in the oil for 6 minutes, gently shaking them from time to time. Carefull remove and drain them. Drizzle maple syrup over the fritters. Makes about 10 fritters. Potatoes are central to Irish cuisine and have brought both joy and tragedy to the Irish people. This recipe comes from Michael Collins, the chef at the Green Emporium in Colrain, Massachusetts, now a pizzeria. Michael likes to serve hearty soups along with his pizza. This one reflects his Irish heritage and therefore serves as an appropriate addition to a Saint Patrick’s Day (or week!) menu. He warns that the soup is quite heavy; if you look at it closely, you’ll see that it’s definitely NOT low in fat. Serve it in small quantities as part of a balanced lunch, however, and you’ll enjoy it without feeling too guilty. We tend to think of potatoes as not terribly full of flavor, but this recipe shows that they can star in a dish. It occurs to me that chives might be nice as a garnish instead of the suggested herbs……..
Heat the oil in a saucepan over medium heat. Add the garlic and leeks or onions. Sauté for 5 minutes. Add the potatoes and stock. Bring the soup to a boil, cover it, and simmer it for about 15 to 20 minutes or until the potatoes are cooked through. Mash the potatoes a little if you see large chunks, but don’t get rid of them entirely. Stir in the remaining ingredients (save a little of the herb for garnish), and cook for 1 minute more, stirring. Crumble a little bacon on top if you like for extra flavor (and calories, I fear). The leftover parsley or dill also looks nice on top.